This posey vase was made by Pates Pottery, which operated out of Belmore, Sydney from 1946 -1990. The deco styling of the vase is deliberate, although it was made much after that period; it seems nostalgia for things past [and styles familiar and remembered] has always influenced pottery makers. 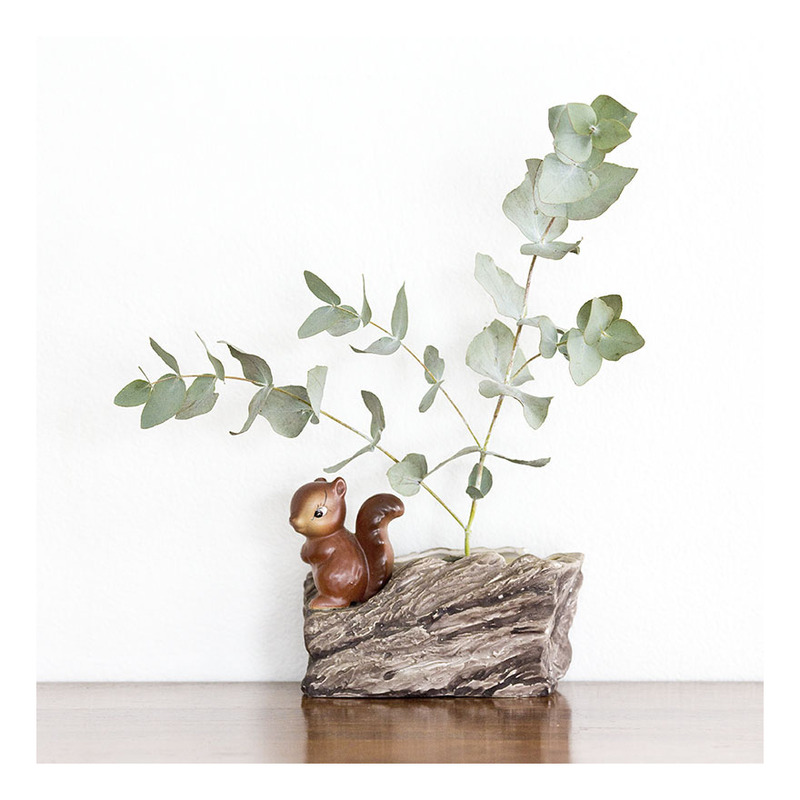 This lovely green and brown vase is perfect to display wattle – the joey figurine is just along for the ride. 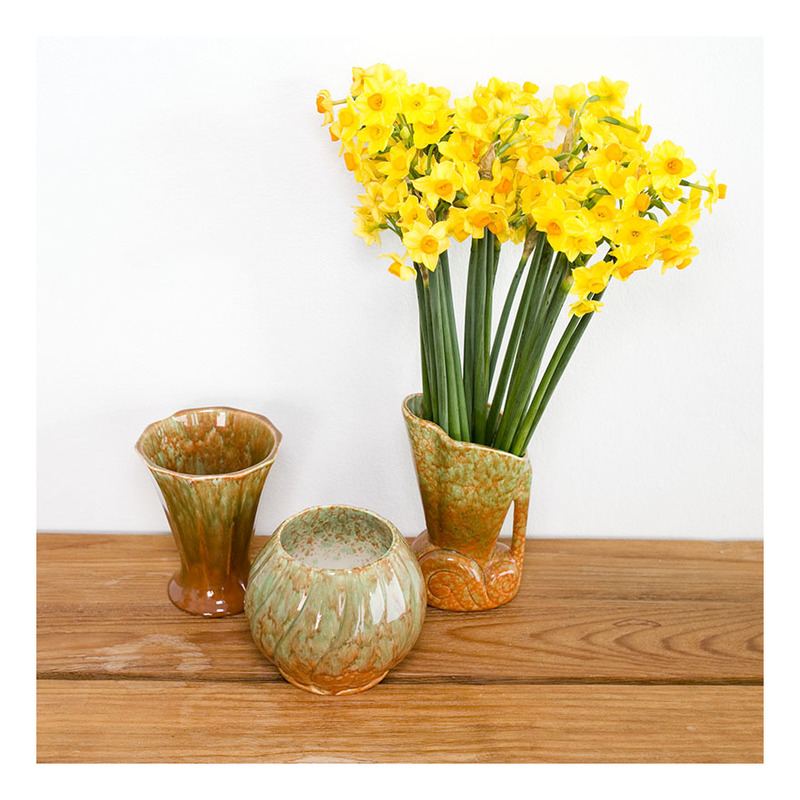 McCredie pottery made vases and domestic ware – often a distinctive matt outer glaze as seen in this image -and a contrasting coloured shiny interior glaze. The forms were simple and strong, quite different to a lot of 30s and 40s pottery- employing what might be termed ‘architectural’ or structural forms. This selection of small ‘flower’ shaped vases evidences the variety of colours that can be found on McCredie vases. As with all her pottery, the vase is hand signed on the base: McCredie N.S.W. 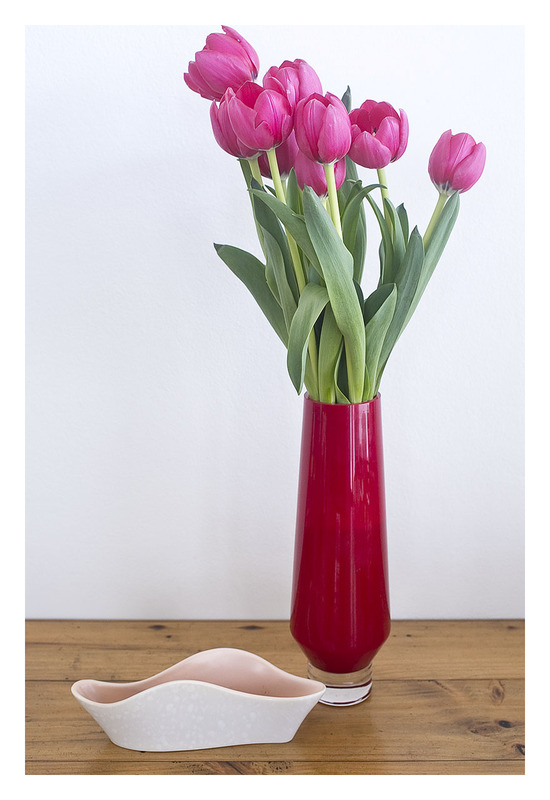 A very kitsch vase from the 70s- which [in my opinion] can only really work with a very minimal flower arrangement. This is ikebana, 70s style! I haven’t been able to ascertain the maker of this fine vase- but the kindly old lady who sold it to me assured me that it was Japanese [a very exotic import in the 70s] – and that it was “fine art”. The vase comes complete with that ‘oasis’ stuff that helps stand flowers up- I was tempted to remove it but found it oddly helpful in holding that Eucalypt branch. Following from my last post, here are some more archetypal works from the Architect-turned-potter Nell McCredie. An experiment in styling: a beautiful 50s ‘wave’ vase by Poole with a reproduction glass vase. The old and the new together; ceramic and glass. And pink tulips; a gift from my partner. The twintone Poole vase was designed by Alfred Read in the 50s – as part of Poole’s ‘Freedom’ range. This range saw asymmetric forms created in the same colour range as existing pieces – so one could introduce a bit of funkiness without going completely crazy. A little bit of modernism could creep into your conservative tea service! This vase is stamped C97 which indicates a vase in the ‘peach bloom’ [pink interior] and ‘seagull’ [mottled grey exterior] colouring. I have other examples of this ‘twintone’ [Poole’s descriptor] – tea cups and saucers – elsewhere on my blog. The pastel shades of the powder pink and muted grey are such classic 50s colours – but I love how this free-form shape starts to anticipate the 60s. Some more of my Diana pottery collection- an inter-war pottery manufacturer located very close to where I now live. The pottery operated from 1940 to 1975 – and these vases evidence a post-war nationalism in the use of drip glaze colours : the particular Australian browns and greens of the Eucalypts. Winter is daffodil time in Sydney: I like the colours here and particularly like the Diana vases on the timber table. Daffodils and Eucalypts are a bit of a mixed metaphor – but the old adage that a group of three a collection makes, I think, is true. Pates pottery is one of the main areas in which I collect. If you’ve read my blog before, you’ll remember that Pates Pottery operated out of Belmore, Sydney from 1946 -1990 [and I have an affinity for between the wars pottery, especially potteries that were located near me in Sydney.] Pates’ designs and colours were influenced by the 1950s and 60s furnishing and domestic colour trends; and like many other pieces of this period, crimson and green or pink and green colourings abounded. These wall pockets are made to be hung on the wall, so as to hold water and floral arrangements. 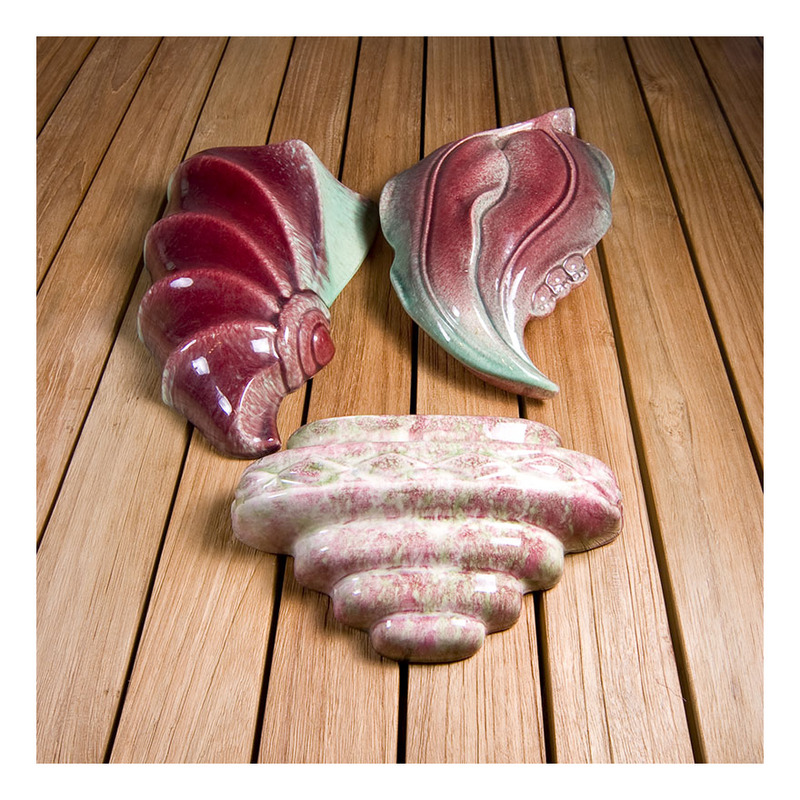 The three shown here are: ‘sea scroll’ ‘gum leaf’ and ‘art deco’ [this despite the fact that it was made in the 50s.] The colours and forms are quite beautiful, and the three of them hung together is quite something. I am now reluctantly parting with some of my Pates collection…I alas lack the wall space in which to display these vases to their full advantage. And they should be seen to their full advantage! 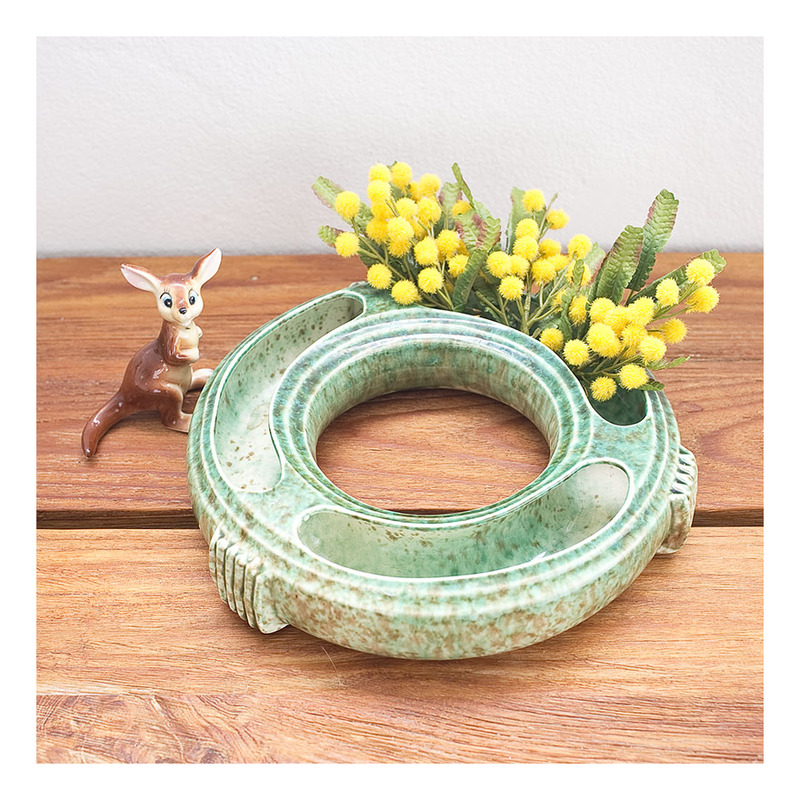 I have posted Diana pottery before…I am very partial to Diana as it was made in a pottery that operated in Marrickville, Sydney from 1940 to 1975- very close to where I now live. These two pieces are quintessentially 50s pieces – the vase has a lovely mottled grey outer colour and a beautiful yellow inner. The yellow is repeated in the coffee pot’s lid, the two-toned theme being popular in the 50s. The shapes of the pieces are also very 50s- the funky asymmetric form of the vase and the tilted line of the coffee pot. You’ll notice that the vase still has its original Diana sticker – stickers tend to make a piece more valuable, and it’s in perfect condition. Likewise the coffee pot, which has never been used. Regulars to my blog will know that I collect Diana- from the 40s in the colour marking of green and brown [this evidencing my nationalistic streak] and while I love these pieces, they are not part of my permanent collection.